WEST WINDSOR — In convincing fashion, The Pingry School girls tennis team defended their NJSIAA Non-Public A title, routing Holy Angels, 5-0, Thursday afternoon at Mercer County Park. The Big Blue advanced to Sunday’s Tournament of Champions, which will be at the Garden State Tennis Club in Edison. Madison Stevens, Christina Zajkowski and Jacquie Jakimowicz all dominated their singles matches, winning in straight sets for Pingry. Stevens took care of a pesky Adrianne Alfonso 6-1, 6-3, Zajkowski disposed of Christen Duff 6-3, 6-0 and Jakimowicz rolled through Jackie De Rocher 6-1, 6-1. On the doubles side, Jennifer Guo and Avery Hatfield bested Eliza Haynes and Fiona Williams 6-2, 6-2, while Wesley Streicher and Tiffany Yao edged Alison Kim and Carla Nilo 6-2, 6-0. Gill St. Bernard’s played one of the best matches of the day against Newark Academy in the Non-Public B final, but came up just short, 3-2. It all came down to Sharon Gin in her second singles match against Hannah Gould, but the freshman ran out of gas, falling 7-6 (7-4), 6-3, in the deciding match of the day. Krishna Patel won the first singles match for Gill St. Bernard’s over Rebecca Gorelov 6-1, 6-3 and the doubles tandem of Kendall Dunn and Jacqueline Fuentes toppled Sophia Busam and Danielle Sidi 6-4, 6-0. Stephanie Fuentes fell at third singles to Crystal Wang 6-4, 6-3 and the doubles team of Lucy Dunn and Carolyn Najarian was defeated by Rakhi Kundra and Jocelyn Tolpin 6-1, 6-1. Even with the loss, Welcome acknowledged that the year was a success. Singles: Madison Stevens (P) d. Adrianne Alfonso 6-1, 6-3; Christina Zajkowski (P) d. Christen Duff 6-3, 6-0; Jacquie Jakimowicz (P) d. Jackie De Rocher 6-1, 6-1. Doubles: Jennifer Guo and Avery Hatfield (P) d. Eliza Haynes and Fiona Williams 6-2, 6-2; Wesley Streicher and Tiffany Yao (P) d. Alison Kim and Carla Nilo 6-2, 6-0. Singles: Krishna Patel (GSB) d. Rebecca Gorelov 6-1, 6-3; Hannah Gould (NA) d. Sharon Jin 7-6 (7-4), 6-3; Crystal Wang (NA) d. Stephanie Fuentes 6-4, 6-3. Doubles: Kendall Dunn and Jacqueline Fuentes (GSB) d. Sophia Busam and Danielle Sidi 6-4, 6-0; Rakhi Kundra and Jocelyn Tolpin (NA) d. Lucy Dunn and Carolyn Najarian 6-1, 6-1. WEST WINDSOR — After rolling through the NJSIAA Central Group I Tournament and reaching the state semifinals, the Metuchen High School girls tennis team simply ran out of gas and into a powerful opponent on Thursday as. Glen Ridge ended Metuchen’s run by sweeping the Bulldogs 5-0 at Mercer County Park. Metuchen was behind from the start as all three of their singles players dropped the first set, winning just two games in the process. All three, however, improved in the second set, but not enough to overcome the Glen Ridge players. Catherine Popow never got into a groove at first singles as she was upended by Kendall Smith 6-1, 6-3. Catherine’s sister Anna fell at second singles 6-0, 6-4 to Paige Moriarty and Lisa Allgauer battled hard in the second set by succumbed to Katie Frohling 6-1, 7-6. The doubles squads of Siri Uppuluri and Tiffany Yao, along with Laura James and Christina Michalski, were overwhelmed by Glen Ridge, the scores 6-1, 6-0 and 6-0, 6-0 respectively. But, even with the loss, Strauss knows that it’s an accomplishment to have made it this far. “I couldn’t be more proud of these girls. They work hard and we knew we wanted to challenge ourselves with some better opponents early on and it helped us prepare for this match today. I couldn’t be more proud of all the hard work they put into this season. It’s a great group of girls to work with,” he said. Singles: Kendall Smith (GR) d. Catherine Popow 6-1, 6-3; Paige Moriarty (GR) d. Anna Popow 6-0, 6-4; Katie Frohling (GR) d. Lisa Allgauer 6-1, 7-6. Doubles: Maddie Baione and Erin Carr (GR) d. Siri Uppuluri and Tiffany Yao 6-1. 6-0; Tessa Powell and Julia Tolmachyov (GR) d. Laura James and Christina Michalski 6-0, 6-0. 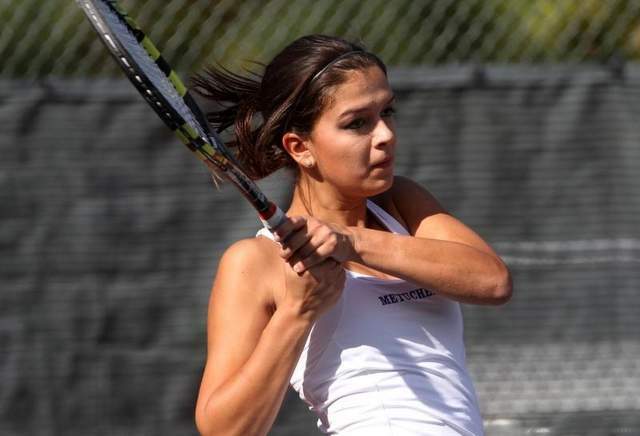 METUCHEN — On a day when the Metuchen High School girls tennis team repeated as Central Group I champions, third-singles player Lisa Allgauer was entrenched in the match of the day against New Egypt’s Dianna Byrne. With all of the other four matches already complete and the Bulldogs already having wrapped up the title, Allgauer trailed in the second set, but rallied to win the final three games, capping an afternoon sweep for Metuchen. The Bulldogs (16-1) advance to Thursday’s state finals at Mercer County Park in West Windsor on a serious roll. The top seed in the Central Group I bracket hasn’t dropped a set since the quarterfinals against Point Pleasant Beach, after sweeping Highland Park and New Egypt. First singles player Catherine Popow did her part to get Metuchen off on a good foot, disposing of Anna Farrand 6-0, 6-0. From there, her teammates did the rest to ensure a clean victory. Anna Popow, Catherine’s younger sister, was nearly as dominant in second singles, beating Zena Merni 6-0, 6-1. With Allgauer’s victory, Metuchen only dropped seven games in the three singles matches. “Coming into the season, we had high expectations, knowing we had our three singles returning and Tiffany has been playing great at doubles. But we had three new girls come in and fill the voids and it’s pretty amazing what we can do when we play up to our potential,” Strauss said. Tiffany Yao and Siri Uppuluri dominated their first-doubles match against Cassidy Wiltshire and Brielle Perrins, 6-0, 6-1, and Laura James and Christina Michalski sealed the deal against Devin North and Sarah Daly 6-1, 6-3. Strauss said he hopes his squad plays like it did on Monday every day, winning all five matches in straight sets, but knows that momentum is key in doing so. Singles: Cathernie Popow (Met.) d. Anna Farrand 6-0, 6-0; Anna Popow (Met.) d. Zena Merni 6-0, 6-1; Lisa Allgauer (Met.) d. Dianna Byrne 6-2, 6-4. Doubles: Siri Uppuluri and Tiffany Yao (Met.) d. Cassidy Wiltshire and Brielle Perrins 6-0, 6-1; Laura James and Christina Michalski (Met.) d. Devin North and Sarah Daly 6-1, 6-3.Records: Metuchen 16-1, New Egypt 9-4.